The New Rachell Allen INTEGRATED REVIEW PROGRAM integrates BRAIN RN™ + NCLEX Multiple Choice Strategies ! The program teaches you memory tricks and devices for easy learning, better brain performance and longer memory retention. With Brain RN™, you will learn memory aids and mnemonics, understand difficult concepts more rapidly, overcome mental blocks, improve memory, reduce study time and pass NCLEX. Created by Rachell Allen, NP, MSc, RN, a university professor who taught her students how to pass any tests. Too Close For Comfort. Rachell Allen's new Online NCLEX Review lounge makes a great studying place. Everything begins with the unforgettable aroma of coffee. Nice vibe too, comfy couches, complimentary books and magazines to read, wi-fi internet access and a helpful staff ready to recommend some good brain booster drinks. Rachell Allen makes an effort to make you feel comfortable while you're reviewing NCLEX online. Due to popular demand, Rachell Allen has opened its doors with NCLEX Review Centers in Manila, Philippines and soon the rest of Asia. Registration is on a first-come first-served basis. Limited seats. Reserve your slot now! In order to reach out to more global companies, Rachell Allen licenses the Review Program and BRAIN RN™ packages to qualified education providers worldwide. 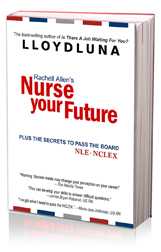 Rachell Allen reveals her secret strategies for answering NCLEX multiple choice tests. Sink in comfortable seats, sip a cup of tea or frapuccino and meet other students of Rachell Allen's Online NCLEX Review Program. Share studies and ideas on passing NCLEX and CGFNS. Study materials and workbook together. Out of more than 78,000 who took the nursing board in 2007 and with over 700,000 nursing students in the Philippines alone, who will succeed and who will fail? No one knows. The fact that there will be some who will make it and some who will break it remains. Do you have what it takes to succeed? This book has some secrets. It intends to advise you on how success is made in the nursing field.